So a couple of years ago, I get this email from my friend Jennifer Carrasco asking about canvas for a big job... 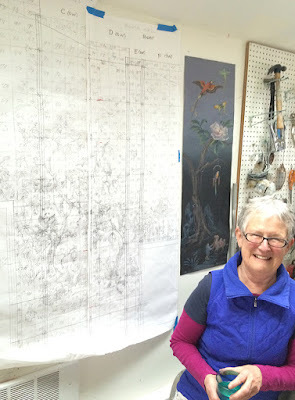 I love talking shop with my fellow muralists and I was happy to dump all sorts of advice on her whether needed or not. 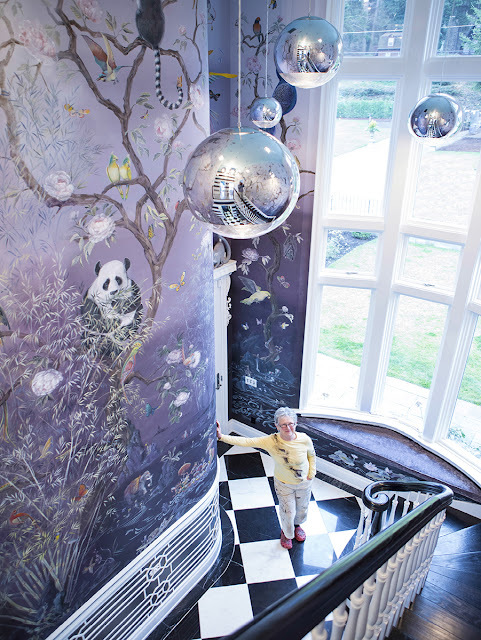 For the next year or so there was a lot of back and forth about the technical and physical challenges of this huge commission of Chinoiserie, which Jennifer designed in a highly personal style including many details that resonated with her client's personality and philosophy. 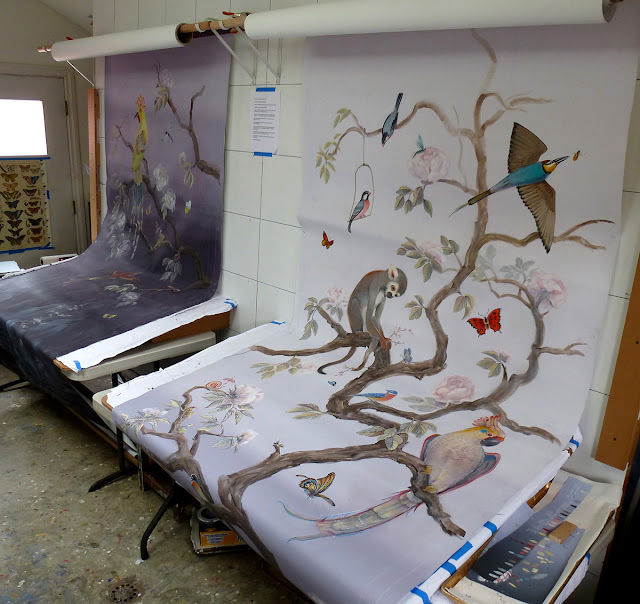 The 20 foot high mural panels were painted for a fabulous home on Vashon Island, creating a truly over-the-top fantasy rivaling anything you can find in Brighton or Drottningholm. 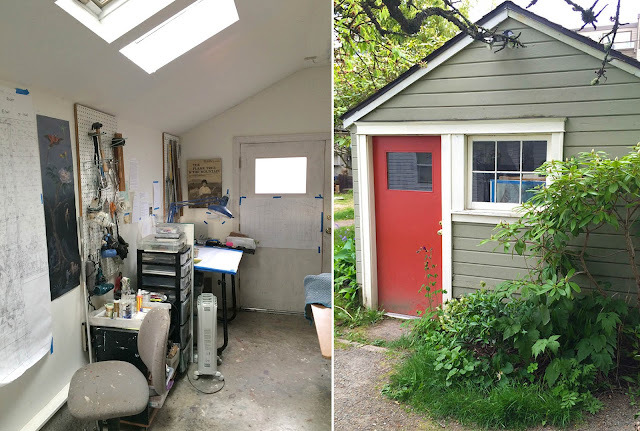 As I am a huge fan of Jennifer and her work I was very excited to get a chance to visit her Seattle garden studio after Salon 2014 was held in Seattle last May, just after this stupendous mural had been installed. Surrounded by her garden, Jennifer's studio is a charming and compact creative space cleverly outfitted to her needs thanks in large part to the carpentry genius of her partner, Phil. Large projects require enormous amounts of organization and planning, especially when being produced in smaller spaces. 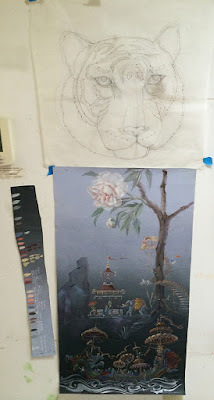 The entire chinoiserie project was designed and laid out in a scale drawing overlaid with a carefully numbered grid, the staggered panels were measured and cut in a large sail loft, and then sent to a commercial paint shop to be spray painted with the gradated colors of the background, then the grid transferred to the canvas. Phil designed an ingenious system to allow Jennifer to paint these 20+ foot high mural panels in this studio, by devising two stations with "drafting table" style painting areas and pairs of rollers to dispense and roll up the canvas. This way Jennifer can paint seated at a large, angled table rather than standing on ladders, or sitting on the floor or any of the other difficult postures we have to assume when doing large pieces Jennifer bragged to me early on that this set up "has added years to my mural painting life." 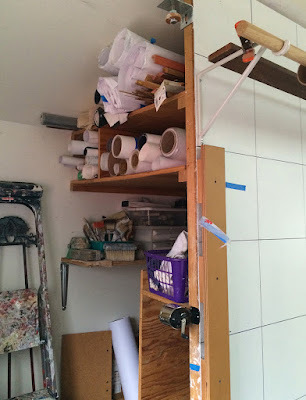 I really loved the storage opportunity that was built into the back of the painting wall. I'm afraid I am the type to get rather too excited about such things. In addition to this charming style of Jenoiserie, as she calls it, Jennifer is well known for illustration work and for painting fearlessly colorful murals and environments such as the famous ballroom of the Seattle restaurant The Ruins. Her work is infused with humor, nature and pure joy. 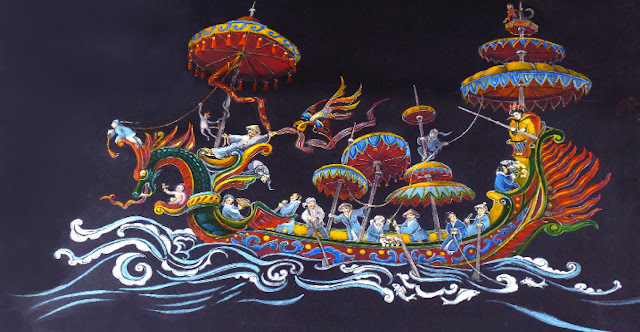 You can see more of her paintings at her website as well as her fun blog. Jennifer is also widely regarded as a skilled and generous teacher of painting techniques. Next month she will be making an appearance in Indianapolis at the Paint Decor Annex, to teach her unique style of Chinoiserie. Selected Jenoiserie is also available now via Spoonflower in fabric, wallpaper and other printed items!! So pleased and a tad jealous you got to visit Jennifer on this special project. Thank you for sharing it with the rest of us! Jennifer does such gorgeous work... 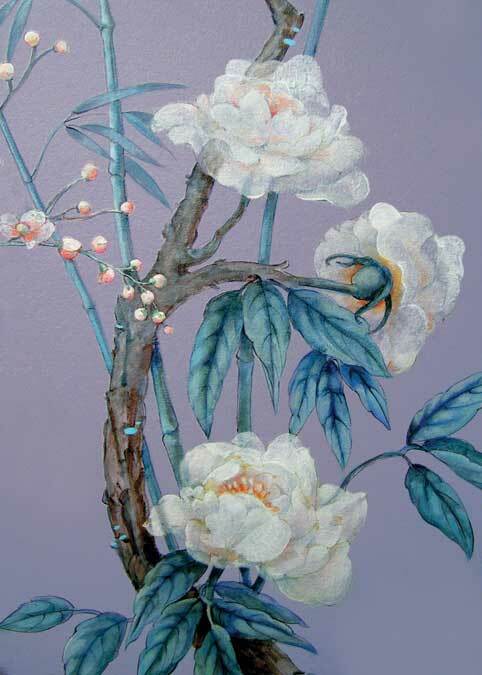 I love the translucency of her peonies and her color palette. Also great easel setup!